We all have photos that we love stored on our computers and smart phones. Why not bring them to life with a unique photo holiday ornament. Our custom photo wood ornaments will give your holiday home decor an artistic and rustic flair. Perfect for candid family pictures or fun snapshots, you can enjoy a walk down memory lane every time you admire your Christmas tree. Let your custom wood ornaments show off your family’s most treasured moments or create a unique gift that anyone on your shopping list will be sure to enjoy. Not only can you showcase your favorite digital images as personalized holiday ornaments, you can decorate any part of your home to liven up the holiday season. Choose several photos and create an array of wood photo ornaments that will surely add interest to your Christmas tree. Create a festive holiday centerpiece in your living room by hanging a collection of wooden ornaments from your mantle. Perfect for window decorations or filling up a table-top ornament tree, you can add a little holiday cheer to any corner of your home. 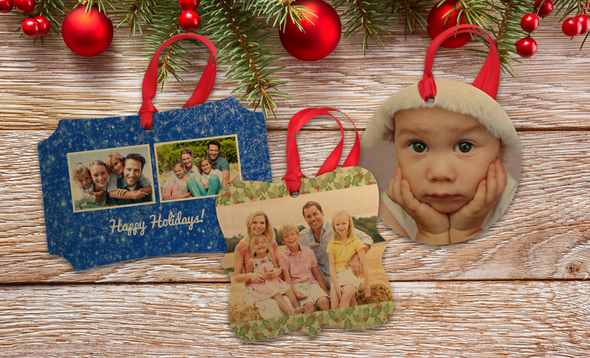 Printed on real, high-quality maple, each wood photo ornament will add a rustic yet elegant charm to any holiday display. Choose from 3 different styles including round, fancy square and scalloped corne. You will be sure to find just the right fit to display your cherished photos. Each picture is printed on a smooth finished front with an unfinished wooden back allowing you to add your own handwritten message. In addition to customizing your ornament with a favorite photo, choose from several layouts and background colors that will add a personal touch to your distinctive holiday décor. Each ornament includes a complimentary red ribbon so that you can easily hang it anywhere in your home as soon as it arrives. Create your own custom ornament this year that will draw attention to your holiday decor. Print a single family portrait or choose a series of prized snapshots and make yours a meaningful addition to your holiday ornament collection. Looking for a unique and thoughtful holiday gift? Personalize a wooden ornament and create a special gift that your loved ones will adore for many years to come.